Kiralagala Archaeological Reserve, not to be confused with Maha Kiralagala near Wilpattu National Park, is the site of an ancient monastery known as Veherabendigala or Veherabandhigala or Weherabandigala in the chronicles. The modern name “Kiralagala” is stressed on the third syllable. 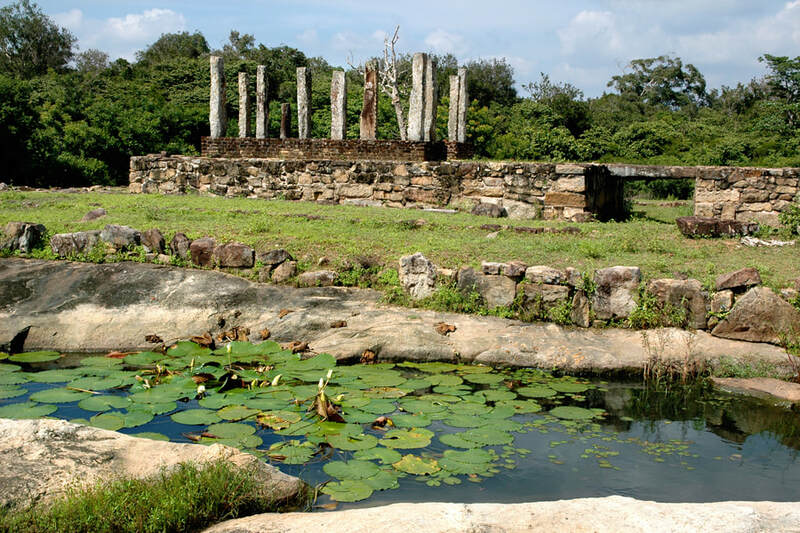 The rarely visited 5 hectare Kiralagala complex of a ruined Buddhist monastery from the mid and late Anuradhapura period is situated 6 km west of Horowupotana at the road to Medawachchiya. The distance from First House Mihintale is 45 km. Kiralagala is a off-the-beaten-path heritage site of considerable historical significance. The site consists of one of Sri Lanka’s largest monastic pond (Banda Pokuna) in 1 km distance from the ticket office, now forming the two ends of the archaeological site, a small stupa, a tree-platform (Bomaluwa), image houses (Pathimagara), a hospital (Janthagara), several meditation platforms (Padanagara) and meditation paths (Sakman malu). The ancient site was much larger in antiquity, when the settlement area also comprised the ruins of Kulumiwakada (Kulumimakada) in about 4 km distance from Kiralagala. Veherabandigala is one of the five most important sites of so-called Padanagara Parivenas, monasteries of the ascetic Pamsukulika brotherhood. The other famous Pamsukulika sites are Ritigala, Arankale, Manakanda and Anuradhapura’s Western monasteries. However, Veherabandhigala seems to be the earliest example. One reason for this assumption is, that the typical Padhanagara platforms are of an archaic less-developed design. The other reason is that Veherabendigala alias Kiralagala is the only large Pamsukulika site where elements of other types monasteries such as stupa and image house and Bo-tree terrace can also be found in the centre of the monastic complex. Usually the absence of stupas, Buddha images and Bo-tree are a characteristic feature of forest monasteries of this reform brotherhood. In the case of Veherabandigala, it seems likely that those typical elements of other types of monastic architecture are from a previous complec from the mid Anuradhapura period arund the 5th century A.D., whereas the typical architecture of Pamsukulikas, such as meditation platforms, meditation path and Janthagara, are from the late Anuradhapura period but earlier than the classical aramic complexes of this type, which belong to the 7th to 9th century. Thus, the Pamsukulika buildings in Kiralagala would be from the 7th century A:D. It would come to no surprise if the typical features of Pamsukulika forest monastery archticture were developed in a provincial part of the Anuradhapura kingdom. Veherabendigala was in 60 km distance from the capital. Pamsukulikas formed a non-heretical brotherhood, their forest monasteries were administratively attached to one of the large city monasteries of Anuradhapura, like many village temples, too. Monks dwelling in the city were mainly interested in studies, whereas village monks were more concerned with pastoral services. Those monks primarily focused on meditation prefered to stay in forest monasteries. But there were different kinds of Buddhist forest dwellings in ancient Sri Lanka. Some were inhabitants of natural caves, others lived in systematically planned ritual complexes with stupas, image houses and Bo-trees. Pamsukulikas differed from other monks in various ways. They did not practice relic or image or tree worship nor did they provide such facilities for lay pilgrims. Their monastic lifestyle was more austere than required by the monastic rules. The Buddha just allowed some ascetic practices without prescribing them. The Buddhist way is called the “Middle Path” between ascetism and luxury. Ascetic lifestyles should not be overstated byBuddhist monks. But some practices were according to the rules. In the Visuddhimagga, the principal work of Buddhagosa, “church father” of Theravada Buddhism, are listed 13 such practices called „Angas“, “Pamsukulika” being one of them. It refers to wearing garments that were not donated but collected at burial sites, where clothes had been left before cremating the bodies. The name of the practice of collecting clothes of deceaced persons is “Pamsukulika”, pronounced “Pansukulika”. The term is often translated to “rag robe”. Wearing robes made of such cloth dound at cremation sites became the namegiving practice of this particular brotherhood of forest monks. The literal meaning of “Pamsukulika” is “dust-slope”. “Pansu” for “dust” might refer to the ashes of the cremated bodies, but the related Sanskrit term “pansana” also means “polluting” or “dishonerable”. The term “Pamsukulika” was also used for burial sites or even middens. Pansukulika brotherhoods came into existence in the 7th century and reached a culmination in the 9th century, when these monks received protection and donations by kings. Two inscriptions found near the stupa (named Q) were dated to the 3rd or 4th century A.D. by the archaeologist Arthur Maurice Hocart. Though only the initial characters are decipherable, the inscriptions obviously mention donations to the Buddhist order. The donator is mentioned first, his name was Abaha Megha. Most probably, this name refers to King Gothabhaya, also spelt Gothakabhaya, who reigned in the 3rd century. According to the 36th chapter of the Great Chronicle, the Mahavamsa, he was also known under the name Meghavanna Abhaya, because he is said to have founded a monastery named Meghavanna. Another king of a similar name from that period is his grandson, Kittisiri Meghavanna, who reigned after the death of his famous father, Mahasena, in the early 4th century. Kitti Siri Meghavanna too is credited with having founded the Meghavanna monastery. According to the dating of the inscription and of King Meghavanna Abhaya alias Githabhaya, the ruined complex of Veherabendigala in Kiralagala is usually dated to the 3rd century A.D. However, most of the structures which can be seen today are from later centuries. And it’s not sure that the term “Meghavanna” found in the chronicles refers to the forest monastery known as Veherabendigala. The chronicle mentions, that 30,000 monks took part in the dedication cermony. Such a large number of monks could have been assembled in the capital those days. But it seems unlikely that they travelled to a provincial town in 60 km distance.